The British architectural firm has been chosen to design the Lusail Stadium after a lengthy competitive scheme. The stadium will be used to host the 2022 FIFA World Cup in Qatar. They beat the likes of David Chipperfield Architects, Mangera Yvars Architects and Mossessian & Partners. 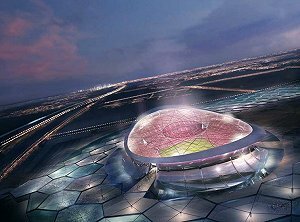 Foster & Partners will team up with ARUP and sports stadium specialist Populous to deliver the final design of the stadium which will be located approximately 15km north of Qatar’s capital Doha in Lusail City. When completed, the stadium will feature and open-air pitch that can be cooled to an optimal temperature of 26 degrees Celsius using cooled and shaded spectator stands, and is expected to hold up to 80,000 people. Hassan Al Thawadi, SC secretary general, commented: “We are excited to announce that the design contract has been awarded to Foster and Partners for Lusail Stadium. We look forward to working with them in creating an iconic, contemporary stadium inspired by Qatari culture. Lusail Stadium will be the centre-piece of the tournament, an architecturally innovative stadium which maintains sporting functionality and delivers on our sustainability commitments. The announcements follows news that the competition’s dates have been altered to November and December to avoid the extreme summer temperatures in the Middle East. Foster & Partners has designed a number of high profile schemes in the Gulf region, including Zayad National Museum in Abu Dhabi and a new terminal at Kuwait International Airport.